I'm taking a break from crocheting for now and return to my crystals because orders just came in. 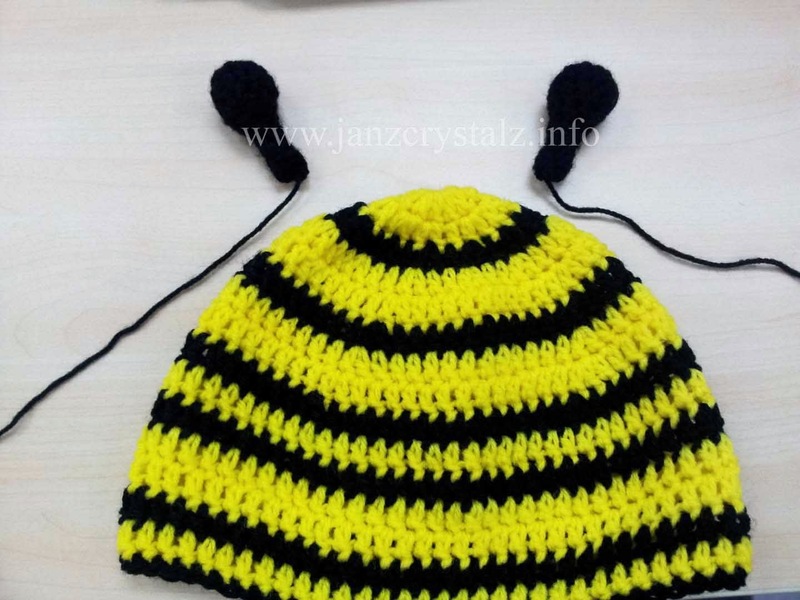 But before doing so, I had to finish first my crochet beanie project, a cute bumble bee design hat for my son. This is actually my first project wherein I followed a written pattern. Yep! 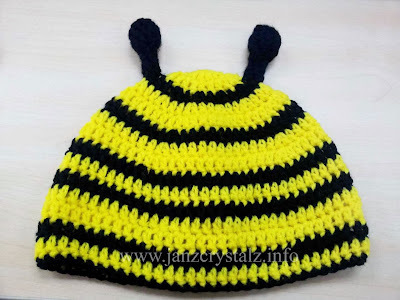 Congratulations to myself because I can slowly understand crochet patterns now, though I still need the help of the ever reliable internet for stitches that I still do not know. 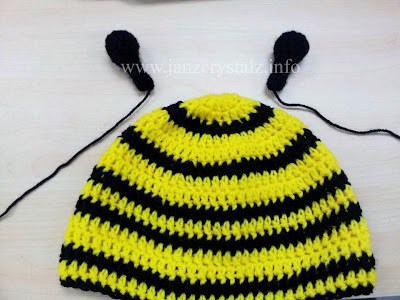 Like in this project, I learned how to make magic ring and single crochet decrease. 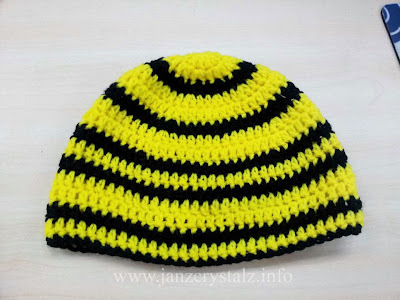 This project was made by yours truly with the help of a pattern from Sarah of www.repeatcrafterme.com called the Crochet Bumble Bee Hat. 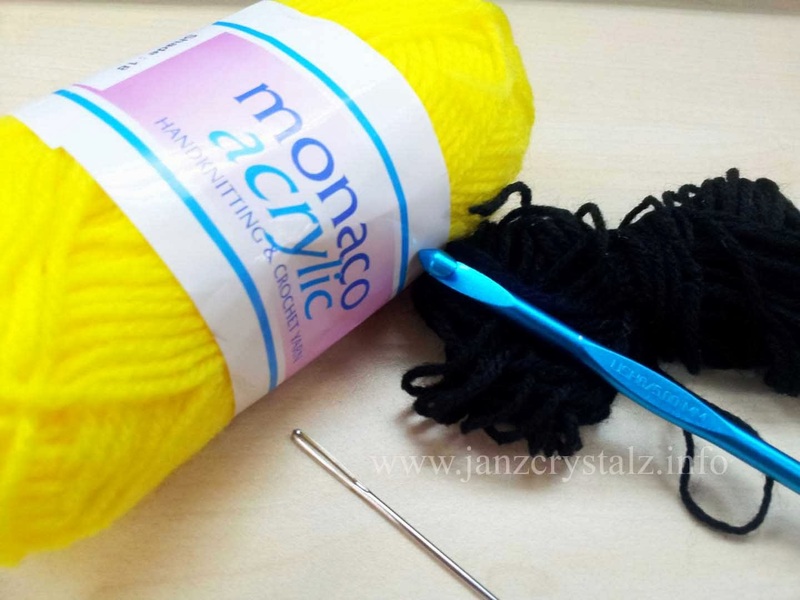 To start with I used two 18 grams of Monaco Acrylic crochet yarns (yellow and black), size H hook and yarn needle. And now for the antennae. The hardest for me, because I did 2 trials before getting the "not so right" pair of antennae but considerable na rin. 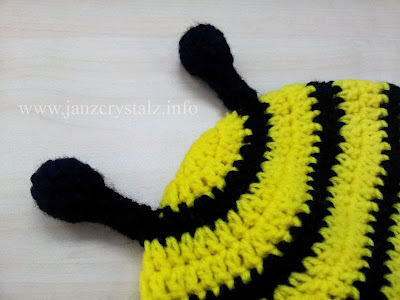 I stuffed the antennae with black yarn, so it will stick up a little. 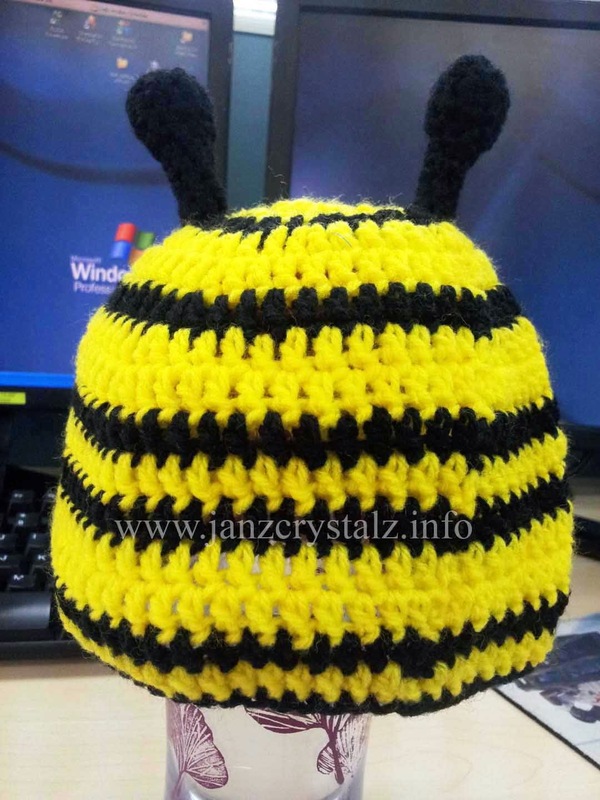 This is also where the yarn needle came in, sewing the antennae on to the hat. And the finish product! charaaaaan! Congratulations! At first talaga, mahirap sundan ang mga patterns. Different countries had their different names on stitiches. Like for example, in UK dc is equivalent to sc in US, tc is dc in US but eventually you can already do your own pattern by looking on the design. By the way, I just made bumble bee hat this week as one of the orders. ang cute! will be looking forward to your other creations! My son would love this. Like the transformers character he loves, Bumblebee. Oh cute!!! :D The form reminds me of Shrek, too. Wonderful creation. 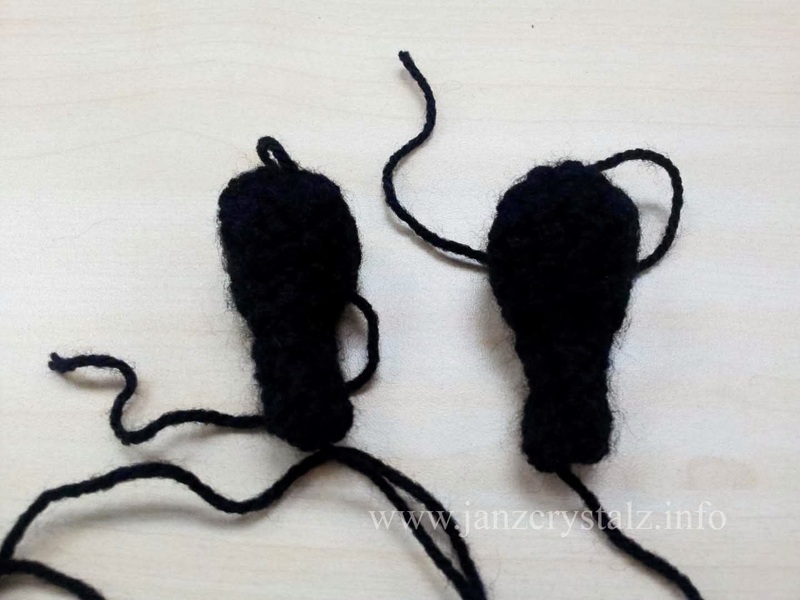 You are really skilled with crochet. Congratulations! You're doing well with your new hobby sis. Keep it up. That hat is so cute.. it sure look nice with a halloween costume. ang ganda! i was never blessed with a crafty hand. 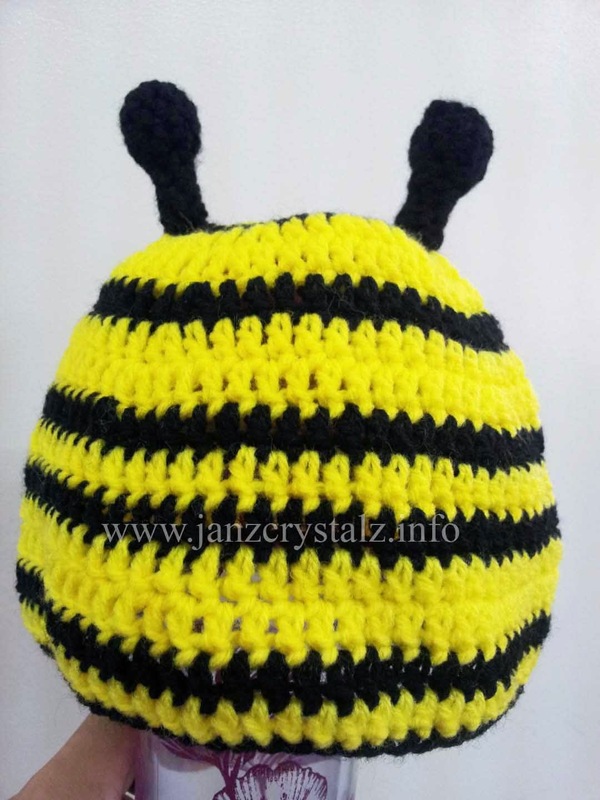 i wonder how i'll fare if i start to do crocheting again, huh? hehe. Sis ang galing mo! Would you know how to make a Totoro hat? Galing naman. Ang bilis mo naman matuto. Daddy Allan is right. Sa una lang mahirap talaga. Like the way you hold the yarn and the hook, to how well you control it and so on. Reading the patterns is also a big challenge as you need to learn the different terms and abbreviations. Sa una talaga nakakaloka but after sometimes it be easier until ikaw na mismo ang gagawa ng pattern. We have that Bumblebee hat too paired with booties. Way to go sis. 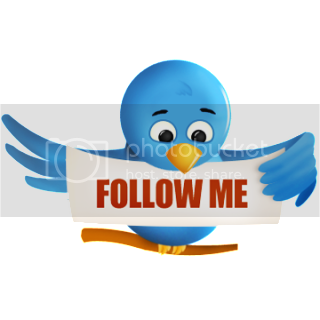 I was hoping to comment on another post but it brought me back here... Have a great week ahead!